Tonight on CBS Hawaii Five-0 continues with an all new Friday October 17, season 5 episode 4 called, “Ka No’eau.” On tonight’s episode when a Detroit hit man is taken out by one of his colleagues on the streets of Oahu, Five-0 is shocked to learn the killer’s surprising motives. On the last episode, Five-0 investigated when three female thieves unknowingly stole something during a tour bus robbery that made them a serious target. Meanwhile, Danny searchesdfor his brother’s hidden millions in order to exchange it for his life. Did you watch the last episode? If you missed it, we have a full and detailed recap right here for you. On tonight’s episode when a Detroit hit man is taken out by one of his colleagues on the streets of Oahu, Five-0 is shocked to learn the killer’s surprising motives. Meanwhile, Chin puts his career on the line to help Danny get the money he needs to save his bother’s life. Steve shows up to Danny’s and sees a muddy mess at the entry way and finds him with fat stacks of cash. He says the problem is there’s only 13 million, not the 18.5 his brother owed Reyes. He now has two days to get five and half million dollar or Matty is dead. Danny shows up to the club to talk to Ko but his guard says he doesn’t like cops. Danny says he’s not there as a cop. He tells Ko he needs a favor. Later, he leaves the club and finds Chin waiting for him. He tells him Danny told him about the money and he thought he’d come here but Danny says he turned him down. Chin says there are other ways and Danny asks what other ways. Chin says he may have an option. A man arrives at the airport, Gordon Bristol, and security asks him to come with them. He asks what’s going on and they ask why he came to Hawaii. He says to work on his tan and they ask if they have his bag. They tell him they ran a random search and ask why he was bringing in a weapon. He says this is a mistake and says he doesn’t even own a gun. They tell him he will be detained until federal agents come for him. He stands to be handcuffed then beats all the airport security guys down in about 30 seconds. Gordon straightens his tie and walks hastily out of the room leaving them all unconscious. Kamekona and Jerry sit in the car outside a vintage book store listening in on a conversation in German. They eat lunch while on their stake out. Kamekona says it sounds like a robot. Jerry explains it’s a translation program since he doesn’t speak English. He asks about the counterfeiting and Jerry says it’s all soccer talk. Kamekona says maybe they just like soccer. Jerry says patience and stamina is the key to surveillance. He says the German will slip up and prove him right. Lou meets Steve and Danny at the airport and tells them about Gordon and the mess he made. He says it’s an alias and he came in an a red eye from Detroit and shows them a pic of the gun and silencer he was packing. Lou tells them he took out five TSA guys with his bare hands and then took off. Steve says to contact Detroit PD for help to find out who he really is. Chin goes to see Gabriel at the prison. He tries to get him to help Danny but Gabriel laughs at the amount he needs and says they’re done. He says he can loan him $500 for a black suit for Matty’s funeral. Gabriel says he doesn’t need Chin’s help and says he has enough friends on the inside and outside. Lou tells Steve and Danny that Gordon’s real name is Joseph Stegner and that he has no known job history, owns a house and lives high on the hog for a “construction” worker. He has been connected to some violent crimes but nothing stuck including the murder of a juror. Looks like he’s tied to organized crime including the Bagosa family. Lou says they are one of the 24 original crime families. He says they are an active syndicate because of Albert Bagosa, third generation boss who rules with an iron fist. Steve asks who’s the target and does Stegner plan to take him out. Kono comes in and says they caught Stegner at the mall ATM. Steve tells her to secure the streets and trace him on cameras while they head over. 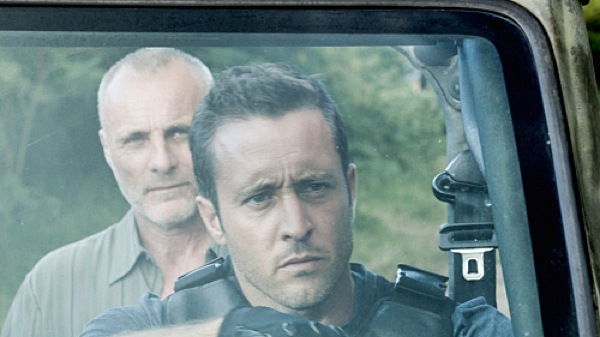 Steve and Lou show up and Kono tells them where he is in the mall. The police have the perimeters locked down. Steve and Lou spot him in but in a high collateral area. Stegner sees the cop car and then notices Steve with his ear mic. He takes off and Kono tells them where he’s running to. They give chase. A uni car puts on the lights and gives chase. They run him down and he’s surrounded by guns. He says okay but then he’s shot by a guy in a nearby parking deck. Steve shoots that guy but he manages to make it into his car and speeds away. Steve gives chase on foot and the guy fires into traffic as he pulls out. Steve hops up on a police car and drills the guy’s back window full of lead but he gets away. Stegner is dead on the scene and Steve asks why a contract killer would get gunned down. They wonder if his mark found out and took out the killer. Danny is at the suspect’s car and Steve calls over Pua and tells them to search the hospitals. There’s blood in the car so Steve got him. Some EMTs sit at a fast food place for lunch when the guy comes in bleeding and puts a gun to the female EMT and tells them to take their food to go. Steve and Danny drive and Steve says they can get on a plane right now and settle this. Danny says he appreciates the support. They see Chin waiting and pull in near him. Chin says he’s sorry and tells him to tell Reyes he has to change terms and take half and says he can have the other half when Matty is released. Danny says he can’t risk Grace’s life over this. Charlie tells Lou and Kono that he ran the blood and found out the guy’s name is Nick and that he’s also a shooter for the Bagosa family. Kono wonders why one hit man would kill another and they wonder if it’s a family feud. She suggests that Nick wanted the contract the Joseph got. Agent Chapman shows them a profile on Nick Mercer who is an expert on the white death – making people disappear – for the Bagosa’s with over 100 alleged kills. He’s called Valentine on the street because he has no heart. Chapman says they know little about his personal life but had a major car accident two years ago and then fell off the map til now. She says the guy has no ego, doesn’t take trophies and doesn’t linger. She says to expect more bodies if he stays there. The EMTs work on Nick but they are struggling to help him. The female EMT, Donna, tries to stabilize the bleeding. The guy says he can’t get to the bullet without a cat scan or x-ray. Nick notices the guy had made a call and that his phone is on. He tells them dumb move and steals their ambulance. Lou comes and tells them they got a lock on the stolen ambulance. Lou and Steve take off and spot it. They pop the lights on and close in. Nick isn’t looking too good. He turns on the ambulance siren and starts weaving around traffic. Lou says he was hoping the guy wouldn’t do that. They speed after but can’t catch up. Lou tells Steve to speed up and he says not to criticize his driving. The ambulance is slowing down as Nick bleeds out. He loses control and drives into the oncoming lane then hits a fence and slows to a stop. Steve and Lou approach but the guy isn’t moving. Lou grabs his gun and says he’s lost a lot of blood. Steve says to call an ambulance and Lou says that’s ironic. Nick wakes in the hospital to a crowd of cops. Steve introduces himself, Chin and Lou. They tell him they know who he is and who he works for but says they don’t know why he killed Joseph, his associate. They ask if it was business or pleasure and he says a bit of both. They ask why he came all this way and he asks if they’ve seen Detroit in the winter. He says he came to protect the people Bagosa hired him to kill. Nick says that’s the truth. Steve asks why the change of heart and Nick says things happen that change your perspective on life. Steve says that’s deep for a man who killed 100 people. He lifts his gown and shows them a scar up the center of his chest. He says he had a head on accident and that he had 100% chance of dying without a new heart. He says Bagosa got him to the top of the transplant list – in fact – he didn’t have to wait on a list. Nick says his heart came from a very special young man. He taught at the worst inner city school and volunteered at a local soup kitchen and built houses for the homeless. Nick says that good man got hit by a drunk driver crossing the street and it was the luckiest thing that ever happened to him because he got a piece of him. He says after that, things changed. He says he went about his business as usual but when it came to the moment of truth, couldn’t pull the trigger. He says it kept happening. Nick says something happened when he got the new heart. He says he thought about the loved ones of those he was told to kill. He says he never told Bagosa. He says he pretended to fill the contracts. Lou asks what happened to the people. He says he found a safe place to hide them and Chin says he made his own witness protection program. Nick says Bagosa found out and Lou asks how he survived. He says he’s that good. Steve ask if Stegner was sent to kill them all and Nick says he couldn’t let him hurt those people. Lou seems skeptical and Steve says he has to know where the people are stashed to prove he’s telling the truth. He says if he tells, he puts them at risk and it’s just not going to happen. They walk out and Lou calls it a fairy tale and Chin says he gives him points for originality. Lou says this is a rehearsed distraction but Steve isn’t so sure. He says they need to get Detroit to corroborate. Chin gets a call from Gabriel, who likes like he’s been beaten. He tells him he thinks he can help. Gabriel says the gen-pop guys don’t like that he’s related to 5-0. Chin says he should have thought about that before he killed his dad. He offers $5.5 million to be transferred to a secure, safe cell at a different facility to keep him safe. Kono says she tracked down info to confirm Nick did have a heart transplant. They wonder if he bought land here, but he’s a cash only guy. Jerry comes in and they congratulate him on his mom selling her house. He says he’s looking for a new basement and offers to clean for room and board. They are silent on this. Steve asks where you would go if you wanted totally off the grid – no phones, no tourists, no contact. Kono says a dozen people and Steve adds with resources to keep them for years. Jerry says West coast of Molokai or the Lanai rainforest. They get a ping from Chapman who says a reliable CI told her that a chartered plane is on the way there with six on board and says they have trouble headed their way. Steve says the have to find the people. They go back to the hospital and tell Nick about the six guys on the way. Steve asks them to give up the location so they can help. He asks how he can know they’re not lying and Steve unhooks his handcuff. Steve says he can help them save the people. On Molokai, the private plan lands and a guy waits with a car. Heavily armed guys get off the plane – real bad asses – along with Bagosa himself. Their contact hands over a map and then Bagosa shoots him. They take off. At the compound, there is no one in sight as Bagosa and his men sneak up on it from the beach. They head into the yard and see bikes abandoned and toys lying about. They spread out to look around. They hear someone talking about the generator being low on fuel and someone having to go to town for supplies. It’s a speaker. Kono takes out the first guy and takes his weapon. Jerry is running sound and diversions. He lures another guy toward Lou who takes him out. Chin takes out another and then Steve another. That’s four down, two to go. Steve’s gets the drop on him and Bagosa is there and takes aim. But then Nick puts a gun to his boss’ head. Bagosa asks if he knows what he’s doing and Nick tells him to put the gun down or says he’ll blow his damn head off. He lowers it and then Nick fires his gun with a dry click and scares the guy. Bagosa tells Nick he saved his life and Nick says – more than you’ll ever know. Bagosa and his men are hauled off to jail and Steve thanks him. Nick holds out his wrists to be cuffed and Steve takes him away as well. They pull up to meet the convoy of all the families that Nick saved. There are a lot of men, women and children. They wave fondly to their savior as they drive by. Chin had the extra $5.5 million and Danny asks where it came from. Chin says it’s an anonymous donor and Danny asks if it was someone related to him and Chin says no one that’s related to him anymore. Danny thanks him and Chin tells him to focus on getting his brother back safely. We see a rough and poor part of Columbia. Danny shows up with the cash along with Steve – it takes four giant bags to deliver it. Reyes’ guys check them for guns then admit them to the back. They take their heavy sacks of loot along. They head downstairs and set the bags down. Reyes says they made it with an hour to spare. His guys check the bags and Danny asks to see Matty. Reyes nods and they unlock a door. Danny calls for Matty. They roll out a 50 gallon drum. Reyes asks if he wants to take him or have him shipped. Danny looks pained and charges Reyes. Danny tells him to kill him now or he’ll put him in the ground first chance he gets. Reyes tells him if he loves his daughter he should go back to Hawaii and never come back to Columbia. They leave with the henchmen but then Reyes hears a struggle and gunfire upstairs. He calls out for Fernando and a body is rolled down the stairs – bloody and limp. Danny comes back down and asks what he just told him. He pushes Reyes back and tells him to look at him as he pulls a gun on him. Reyes does and Danny puts one between the guy’s eyes. Steve calmly watches him murder the thug.